Spring break is not often synonymous with volunteerism and sacrifice, but since 1999 groups of St. Mary’s University students have spent the week giving to others, through a transformational experience called Alternative Spring Break. Brian Buchmeyer (B.S. ’13), coordinator of Marianist Student Initiatives at St. Mary’s, said the experience immerses students in service, culture, faith and relationships. “Students are challenged to think deeply about social justice issues that affect the people they are serving and how those issues connect to their own communities,” Buchmeyer said. St. Mary’s students Samantha Ramos, Paige Gandara-Valderas, Jasmin Rivera and Christina Carrion took advantage of this unique opportunity in March. While other students were carpooling to the coast, this group traveled by van to Albuquerque, New Mexico, to care for people with serious medical conditions at the Casa Esperanza residence. Established in 1992, Casa Esperanza (Spanish for “House of Hope”) fills a need for rural New Mexican families, many from Native American reservations, who must travel long distances for medical care. Many cannot afford extended hotel stays, and, if not for Casa Esperanza, these families might sleep in their cars. The facility primarily serves cancer patients and their families, but also any patient dealing with a serious medical condition. It offers long- and short-term stays and includes a community kitchen, washers and dryers, and a playground area for children. Because it provides these services at a low cost, Casa Esperanza relies heavily on volunteers. The 28-room facility was at full capacity during the students’ stay. Their days were spent helping Casa Esperanza’s lone maintenance man with landscaping. They spent evenings interacting with the residents. The students bonded with a woman undergoing breast cancer treatment. She and her sister taught them words from their native Navajo language. They made a connection with a young couple whose child was born five months premature. The family’s home was four hours away. They also met a mother whose middle-aged daughter suffered severe brain damage as a result of domestic violence, and a 15-year-old cancer survivor in town with his mother for a checkup. 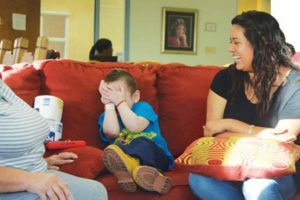 “Just to learn that these people don’t have easy access to medical treatment but were still able to have a positive outlook, it was very inspiring to see,” said Ramos, a junior Finance and Risk Management major. Casa Esperanza also offers counseling for the stress of dealing with illness, education on how to manage medical paperwork, and complimentary dinner every night provided by local groups and organizations. The St. Mary’s students took over the dinner duty their second night, making fajitas for the 60-plus residents, and hosted two activity nights featuring bingo, and arts and crafts. Carrion, a senior Exercise and Sport Science major, found out just before the trip that her grandmother was being tested for cancer, which helped her relate to the residents. “These people are going through so much but they could still smile. I was happy to give my time to provide some of that happiness,” she said. After returning home, Carrion learned that her grandmother was cancer-free, but the lesson on positivity stuck with her. While in Albuquerque, the group also attended Mass at historic San Felipe de Neri Church; visited El Santuario de Chimayo, a National Historic Landmark; took a ghost tour of Old Town Albuquerque; and toured Native American museums and sites. Three of the students saw snow for the first timeat the Sandia Peak Tramway. 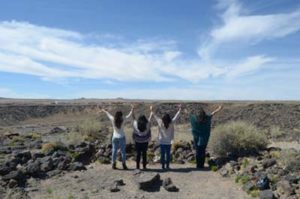 The Albuquerque trip was one of three Alternative Spring Break destinations for St. Mary’s students. Others traveled to New Orleans and some stayed in San Antonio to work at local nonprofits. In all, 30 St. Mary’s students committed their 2016 spring break to service. Rivera and Ramos are Alternative Spring Break veterans, with Albuquerque being their second such trip.